At the Dalhousie Faculty of Agriculture, we too, believe the best way to learn is “by doing” and are a proud partner with 4-H Nova Scotia and 4-H Canada. We were thrilled to host the first ever 4-H Canada Science fair on the beautiful Agricultural Campus. Our fundamental belief systems are the same. Perhaps that is why so many of our most successful students and alumni are also former 4H members. Just take a look at Bailey George and Ally McConchie, representing the Faculty of Agriculture at the Royal Agricultural Winter Fair this November in Ontario. Dalhousie University’s Faculty of Agriculture is proud to #ShowYour4HColours November 1. 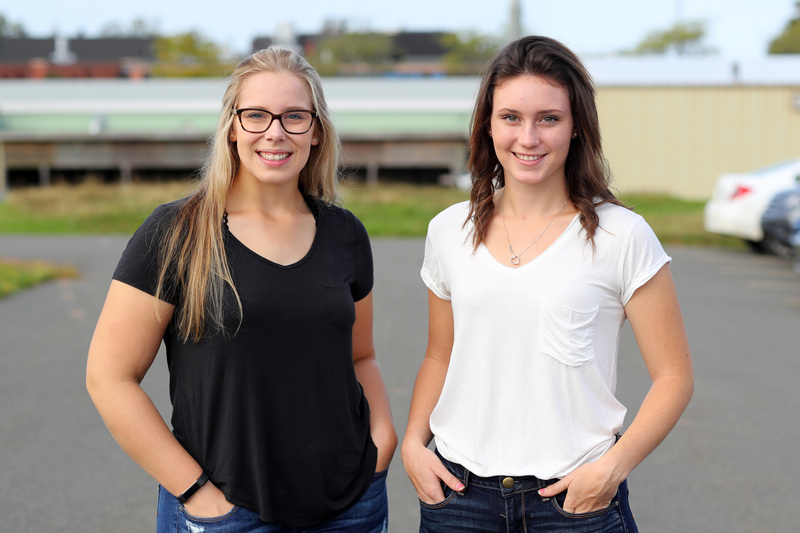 Moving to Truro from separate provinces, Ally McConchie and Bailey George had not anticipated becoming such close friends, let alone having the chance to represent Dal AC the Royal Agricultural Winter Fair in Toronto together. An annual fall fair that brings agriculture to the heart of downtown Toronto, the Royal Agricultural Winter Fair is the largest combined indoor agricultural fair and international equestrian competition in the world. Every November, the Royal celebrates the best in agriculture, local food, and equestrian competition from across the country and beyond. Through a student pitch competition at Dal AC, Bailey and Ally were selected to represent Dal AC at the Royal this November. As representatives, the team of two will host high school seminars at the Royal Fair for students in junior high and high school in the Toronto area. The girls will be at the Royal Winter Fair from November 7-9 and will host a presentation each day. Despite the demanding schedule, Ally and Bailey are thrilled to have been selected to represent their school at such a prestigious event. Bailey and Ally competed in Dal AC’s Royal Pitch Competition in the spring of 2017. The three part competition had students prepare a proposal, present a pitch and finally, a mock presentation. The competition was open to Dal AC students with the goal of selecting two students to present their idea at the Royal Winter Fair. The objective is to teach urban students about agriculture and its importance in many different sectors. For Bailey and Ally, it is also a chance to share their passion and enthusiasm for agriculture with others. Bailey and Ally developed a presentation focusing on agriculture from farm to table for the pitch competition. Based on that, the two developed their presentation titled, “Your Cheeseburger’s Journey” which they will present at the Royal Winter Fair. The presentation will demonstrate how important the agriculture industry is to the production of something as simple as a cheeseburger. It will focus on how the cheeseburger can only be made if you have many ingredients from many sectors of the agriculture industry and showcase the journey that the ingredients must take to get from the farm to the table. For both Ally and Bailey, their passion for agriculture stemmed from a young age. Both from farming communities and active in 4-H, the two met while studying at Dal AC. Bailey, who is from Malvern Square in the Annapolis Valley, is in her second year studying Dairy Business Management. While Bailey has participated in many sports in the past, including rugby, swimming, basketball and hockey, she took a step back from sports to focus on her education. Although no longer involved in such a variety of sports, Bailey has stuck with competitive horseback riding. “I am a competitive hunter/jumper rider and compete at Equestrian Canada shows at the Gold level,” Bailey explains. In addition to equestrian competition, Bailey is also a member of the Evangeline Pony Club. Although she was out of pony club for a few years, she remained active as a volunteer and has re-joined for the 2017-18 year. By taking both written and practical tests on stable management practices and demonstrating her riding skills through riding tests, Bailey’s goal is to move up a few levels this year. Ally, a horse lover like Bailey, is in her second year of Equine Business Management. She comes from the rural community of Central Hampstead, New Brunswick. Ally has also been active in sports, playing on the Dal AC soccer team last year, but has taken a step back to focus on her studies. While completing her education, Ally remains an active member of the Triangle 4-H club. During her 12 years of 4-H, Ally has been a member of numerous projects, including poultry, canine, great outdoors and for the past six years, light horse. Although the girls come from different provinces and different backgrounds, one thing is for sure- they are both passionate and enthusiastic about agriculture. Naturally, Dal AC was the perfect fit for both to continue their studies. As their departure day for the Royal Winter Fair approaches, Ally and Bailey reflect on what advice they would give to future teams competing in the Royal Pitch Competition at Dal AC. It was that energy and passion that led Ally and Bailey to this unique opportunity. Hardly able to contain their contagious excitement, the girls are not only looking forward to sharing their presentation with Toronto students, they look forward to taking in the exhilarating atmosphere of Canada’s largest agricultural fair.